The International Criminal Court in the Hague is being asked to probe allegations of war crimes by Tony Blair, Jack Straw and Geoff Hoon. 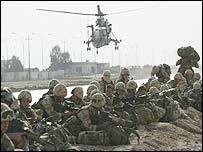 The claims surround the UK's role in invading Iraq and have been raised by the group Legal Action Against War. They say a "principal charge" is "intentionally launching an attack knowing it will cause incidental loss of life or injury to civilians". Michael Mansfield QC said the group wanted to re-establish the rule of law. As well as the prime minister, foreign secretary and defence secretary, the group is also targeting Attorney General Lord Goldsmith, who advised that the war was lawful. The Foreign Office declined to comment on the petition, saying only that it stood by the legal basis given for the war. Mr Mansfield said none of the reasons given for the war - weapons of mass destruction, violation of United Nations resolutions and removing Saddam Hussein - provided a satisfactory legal basis for attacking Iraq. What is the point of having the ICC if on one of the gravest things this country has even done the ICC is going to turn its back on it? The International Criminal Court (ICC) did not have jurisdiction to rule that unlawful aggression was a war crime, he told a news conference. But he continued: "The context of considering the particular individual war crimes has to be set against what we claim is an unlawful war. "Even if the ICC decided that the war was lawful, they still have to examine whether what was carried out was proportionate." The use of weapons such as cluster bombs, which had killed many innocent civilians, meant more force than necessary had been used, argued the top lawyer. "We are saying that there are matters here that need to be investigated," he said. "What is the point of having the ICC if on one of the gravest things this country has even done the ICC is going to turn its back on it?" I don't see how the ICC could get involved in the question of whether the war was lawful. The court should not just address alleged war crimes in "banana republics" but should investigate the world's powerful nations too, argued Mr Mansfield. Britain, unlike America, signed up to the court's creation. Mr Mansfield acknowledged there might be "extraordinary reluctance" in indicting ministers on such charges but it was right they were investigated. The Ministry of Defence has previously said it supports the use of cluster bombs against legitimate military targets in order to protect British troops and civilians from further harm. Anthony Aust, a former deputy legal adviser at the Foreign Office, said the petition would not work if the real idea was to test the legality of the war. He told BBC Radio 4's World At One: "If they are merely going to seek a ruling as to the legality of the use of cluster bombs, matters of that sort, then I don't see how the ICC could get involved in the question of whether the war was lawful." Mr Aust said there were good grounds for saying the war was legally justified, as well as counter arguments. "No one is going to have a decision on that point unless it were to go, say, to the International Court of Justice," he added. The International Court of Justice is separate from the ICC and rather than examining individual war crimes, it settles legal disputes put to it by states. The legal petition was launched as the government continued to defy pressure to publish the full legal advice it received on the war's legality.